A Hawaii woman whose last name is 36 characters long has finally gotten the whole thing to fit on her driver’s license and state identification card. Janice “Lokelani”, 54, has a surname that consists of 35 letters plus an okina, a mark used in the Hawaiian alphabet. She received her new license and ID after her campaign to get her full name on the cards prompted the state Department of Transportation to change its policy to expand the number of characters that can appear. Keihanaikukauakahihuliheekahaunaele (KAY’-ee-hah-nah-EE’-coo-COW’-ah-KAH’-hee-HOO’-lee-heh-eh-KAH’-how-NAH-eh-leh) said Monday that she’s happy she was able to help fix the problem of identification cards lacking sufficient space for long names. “Now, in the state of Hawaii, we are no longer second class citizens because of the length of our name,” she said. Hawaii driver’s licenses and ID cards previously had room for names totaling up to 35 characters. The new policy allows 40 characters for last names, 40 for first names and 35 for middle names. Janice Keihanaikukauakahihuliheekahaunaele got the name when she married her Hawaiian husband in 1992. 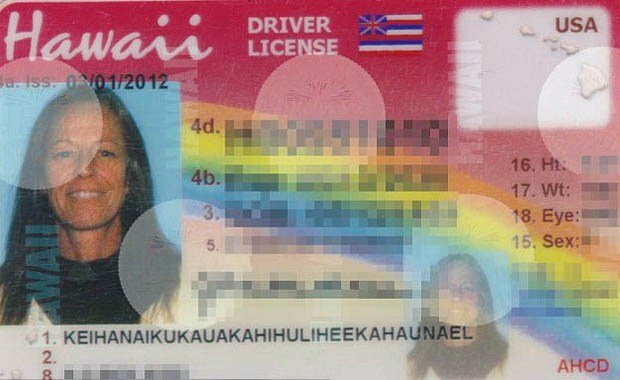 Under the old policy, Hawaii County issued Keihanaikukauakahihuliheekahaunaele her driver’s license and state ID with the last letter of her name chopped off. And it omitted her first name. Janice “Lokelani” told news media about the issue earlier this year after a policeman gave her a hard time about her driver’s license during a traffic stop. The agency’s cards have two lines for names. The first line has 26 spaces for first and middle names while the second line has 26 spaces for a last name and suffix.